The opposition is a very interesting aspect. Two planets pulling equally in opposite directions can create a considerable challenge or tension. The most constructive way to deal with them is to allow both planets equal expression. But this is much harder than it sounds. We have all been conditioned to do the right thing and to try hard to get something right. But this presupposes that there is one right thing to be got right. It requires us to choose one way of acting rather than another. Of course as always much depends on which planets are involved. Some planets like the Sun and Mars are closely linked to our own conscious drives in life. Others like the Moon are more closely linked with instinctive unconscious habit patterns. If we have an opposition between the Sun and the Moon the likelihood is that we would try very hard to be the Sun and focus our energies on the sign and house that it is in. The trouble is, our unconscious, habitual side would keep on undermining this desire by continually acting with the Moon in the opposite direction. This is the power behind the werewolf myth. The classic werewolf story is entirely designed to help us understand oppositions by focusing on the most fundamental one of all, between the Sun and Moon. The werewolf tries extremely hard to stay in the human conscious solar mode but once a month during the Full Moon, an unconscious power arises in him and he is forced to change into a wolf and act in an entirely different fashion. The harder he tries to hold on to his solar self the more insistent the monthly transformation becomes. So when it comes to interpretating oppositions in a chart, it’s important to take into account that the person is almost certain to consciously attempt to identify with one end of it more than the other. This attempt to choose one end will cause trouble because the other end cannot be passed over. One of the greatest advantages of having an awareness of your chart is in the area of oppositions. It helps people come to terms with the two different sides to themselves and to stop trying to choose one over the other. One bizarre example of someone who chose to go in one direction only to succeed in heading in the exact opposite one was Douglas Corrigan. Corrigan was an American pilot known as “Wrong Way Corrigan” due to the fact that he flew in the wrong direction and arrived in Ireland. He had left Brooklyn headed for California, but flew east instead of west for a 27-hour flight. His “accidental” flight made aviation history. He claimed his unauthorized flight was due to a navigational error, caused by heavy cloud cover that obscured landmarks and low-light conditions, causing him to misread his compass. In the Capricorn Astrology Research Project’s study of 20,641 the total number of opposition aspects including ones to the Ascendant was 38,457. This is such a large sample that we can assume the average number of oppositions that anyone would have in a chart is just under 2. Douglas Corrigan had 5.
its fascinating to look at what oppositions they are. The most obvious one is the one that runs close to the horizon between his Mars / Ascendant and Moon. Both Mars and the Ascendant rule the intention to initiate movement. It’s as if his conscious intended direction ( Mars / Ascendant ) to the left of the chart was one way to Long Beach, California but his unconscious ( Moon ) on the right hand side, took him in exactly the opposite direction. It’s particularly interesting that he ended up in Ireland a country that is ruled by Taurus, which is where the Moon is placed. Another significant opposition in Corrigan’s chart forms part of a T Square. Venus is in Sagittarius, the sign of long journeys and the one most associated with flight. Venus is opposite Pluto which would point to a sudden and unexpected incident that destroyed all previous planning. This opposition focuses by T Square onto Saturn which would indicate that something went badly wrong. Saturn is in Pisces, a sign that is strongly associated with misdirection and confusion. The other opposition is between a Jupiter / Neptune conjunction and Uranus. Jupiter is the planet that rules long distance flight and in the early days of air travel, Uranus would certainly be involved. Neptune is the planet of confusion and misdirection so the symbolism of the T Square is repeated here just in case we didn’t get it the first time. So when did all this happen ? Well it might help to realise that this was the most significant turning point of Douglas Corrigan’s life, because he earned enough money in the form of lecture fees, articles and a movie, “The Flying Irishman,” to buy an orange grove in Santa Ana, CA, where he lived until his death. Therefore it was bound to be a Pluto / Sun moment, and so it was as Pluto was square his Sun on 17th July 1938 when he arrived in Ireland. Another serious turning point in his life was when he gave up flying in 1972 with Pluto square to Jupiter, the planet of flight. The actual cause of this however was a Saturn transit. Another look at Corrigan’s chart shows us the difficult T Square, with Venus opposite Pluto in the 8th house of death, focusing onto an apex Saturn in the 4th house of family. Saturn made a conjunction to Pluto in 1972, triggering the T Square when Roy, the youngest of his three sons, died in a plane crash. Douglas’ son ( Venus ) was in a plane ( Sagittarius ) when it crashed ( opposite Pluto ) and he died ( in the 8th house ) causing a tragedy ( apex Saturn ) for the Corrigan family ( in the 4th house ). There was always one question that was left hanging by Douglas Corrigan’s famous flight. Was it a massive mistake or was it actually intentional ? He was a skilled plane mechanic and many people thought he’d flown to Ireland deliberately although he never admitted it. So was it deliberate ? If it was, Douglas Corrigan could not be painted as the victim of his chart. He would emerge as a consummate opposition player who used the confusion of the pull of these planets to go in the direction that he had always intended. Noone could know for sure but Capricorn Research believes that it was. The clue is in the chart with the Mars / Ascendant Moon opposition. We know his intended flight plan, Mars / Ascendant, was Long Beach California and the result was his Moon in Taurean Ireland. But look at which sign Mars and the Ascendant are in – its the cunning and calculating Scorpio, a sign that will often do its best work under cover without anyone else realising it. 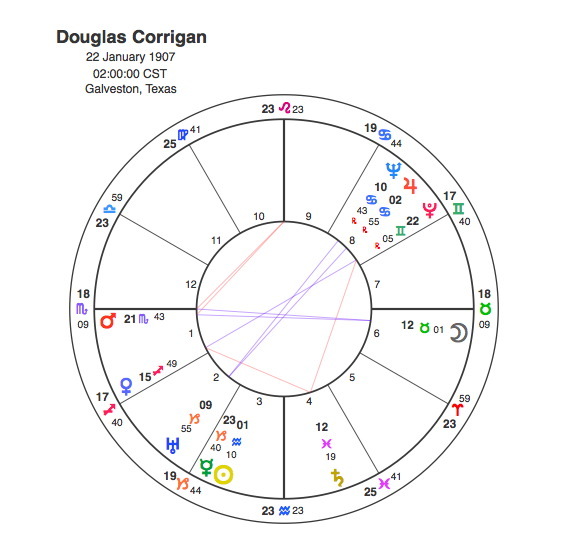 It does seem intentional but perhaps Douglas Corrigan was so relaxed about the 5 oppositions in his chart that he simply gave himself both options and let the Universe decide on the day ?